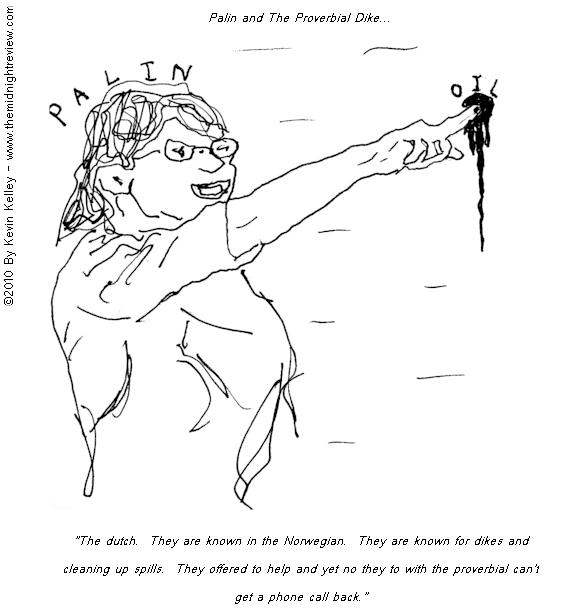 The Midnight Review: Sarah Palin On Fixing The Oil Disaster: "The Dutch... Are Known For Dikes"
Sarah Palin On Fixing The Oil Disaster: "The Dutch... Are Known For Dikes"
"The Dutch. They are known in the Norwegian. They are known for dikes and cleaning up water and dealing with spills. They offered to help and yet no they to with the proverbial can't get a phone call back." Bill O'Reilly asked Sarah Palin if she knows how to fix the the oil leak and instead of answering, she goes off in some tirade against the administration, claiming the Dutch with their dikes can fix everything. What ever happened to that who spiel about America being the greatest, yet now the safety of the gulf of Mexico is in the hand of foreign corporations and can only be saved by the Dutch?